L3 WESCAM introduced its new mission rehearsal and simulation training solutions product line at the Dubai Airshow, November 12–16. The company provided hands-on customer demonstrations of a fully networked solution, including air, ground, maritime and command stations, at the L3 Technologies exhibit. 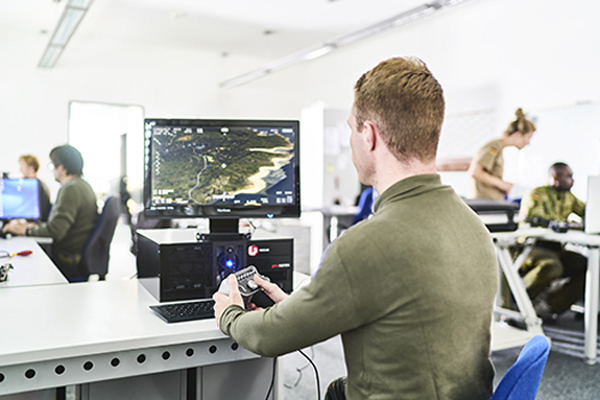 This highly scalable line of training products will enable MX-Series operators and crew members to train independently or as part of a virtual joint-force team using the latest gaming technology at an estimated 70 per cent cost savings over traditional training courses. The Aerospace Industries Association of Canada (AIAC) named the operations team led by Benoit Beaudoin at Pratt & Whitney Canada as the winner of the 2017 James C. Floyd Award for Aerospace Achievement. The award is in recognition of the important contributions to Canadian aerospace success, both domestically and in the global marketplace. Jim Quick, president of the AIAC, said the creation of the Mirabel Aerospace Centre and the Advanced Manufacturing Centres are significant achievements and have revolutionized manufacturing innovation and productivity, not only for Pratt & Whitney Canada but for their Canadian aerospace suppliers and partners. “Mr. Beaudoin and his team have led the development of next-generation advanced manufacturing facilities and processes, making Canadian aerospace more competitive and creating new opportunities for Canadian aerospace employees,” Quick said in a statement. Beaudoin, vice president of operations at Pratt & Whitney Canada, said innovation is at the heart of his firm. “What we accomplished at the Mirabel Aerospace Centre and the Advanced Manufacturing Centres was truly a collaborative effort, bearing the fingerprints of many members of the aerospace industry; all of whom embraced the challenge of creating a blueprint for the future of Canadian aerospace manufacturing,” he explained. Established in 2009 in honour of the chief engineer on the Avro Arrow project, the AIAC’s James C. Floyd Award for aerospace achievement is an annual award that honours exceptional contributions to the Canadian aerospace sector. Viking Air Limited of Victoria, B.C., has sold its second Series 400 Twin Otter to the government of Panama for use by its Servicio Nacional Aeronaval (SENAN) Air Group based in Cocoli, Panama. The aircraft is scheduled for delivery in December. SENAN is the organization within Panama’s national forces that is responsible for public security through use of naval and air means. The Viking Series 400 will be equipped with standard wheel gear for its primary role as troop and cargo transport, and will also be configured for medical evacuation to support emergencies as needed, the company noted. The aircraft will be the second Twin Otter to be introduced to SENAN’s operational fleet, and will join the first Viking Series 400 aircraft delivered in December 2016. Raytheon Missile Systems of Tucson, Arizona, could be providing the RCAF with new missiles. The cost of the purchase is $140-million (U.S.), according to the U.S. State Department which has advised Congress of the Foreign Military Sale. The procurement includes 32 AIM-120D Advanced Medium-Range Air-to Air Missiles (AMRAAMs), 18 AMRAAM Captive Air Training Missiles (CATMs); four AMRAAM Non-Development Item – Airborne Instrumentation Unit (NDI-AIU); two AMRAAM Instrumented Test Vehicles; seven spare AMRAAM guidance units; and four spare AMRAAM control sections for use on their F/A-18 aircraft. Also included in the sale, according to the State Department, are containers; storage and preservation; transportation; aircrew and maintenance training; training aids and equipment, spares and repair parts; warranties; weapon system support and test equipment; publications and technical documentation; software development, integration, and support; system integration and testing; U.S. Government and contractor engineering, technical, and logistics support; and other related elements of logistics and program support. The proposed sale is linked to the potential purchase by Canada of “interim” Super Hornets from Boeing. However, Department of National Defence sources say the missiles can also be used on the CF-18s, which currently are outfitted with another version of the weapons. Seaspan Corporation has announced that Bing Chen will be joining the company as its chief executive officer and will be appointed to the board of directors in January 2018. Gerry Wang retired as CEO and director of Seaspan in November. Peter Curtis, executive vice president and chief operating officer, is also serving as Seaspan’s interim CEO until Chen’s arrival, after which he will continue in his current role. Over his 25-year career Chen has held executive positions in China, Europe and the United States. The Royal Canadian Navy will use OSI Maritime’s ECPINS Warship 6.2 on all ships and submarines. ECPINS is a warship electronic chart display and information system, with military capabilities well beyond NATO WECDIS STANAG 4564, according to OSI, a firm headquartered in Burnaby, B.C. Lockheed Martin and Navantia have signed a renewed memorandum of agreement to collaborate to explore mutually beneficial new business opportunities in the areas of surface ships and naval combat systems. The two firms have collaborated for 20 years over the provision of the Aegis combat system for the Spanish Navy’s F-100 frigates. Between 2000 and 2010, Lockheed Martin and Navantia delivered four F-100 frigates to the Spanish Navy, and in 2013 a fifth and final was commissioned. In 2000, the Royal Norwegian Navy selected Navantia to develop and build five Fridtjof Nansen-class frigates, the last one of which launched in 2009. After the Norwegian frigates, the Australian Hobart class was designed, based on the F-100 with an updated Aegis combat system configuration, the first of which was delivered to the Royal Australian Navy in September. Currently, 11 frigates developed by Navantia and Lockheed Martin sail around the globe.